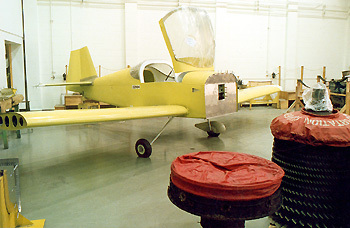 This yellow plane is a Van's RV-6A. The School bought the plans, the instrumentation and the engine. This first project has been under way for six years due to the fact that all the production tooling necessary to the fabrication of the parts was made on the premises. Students then made the different parts and assembled them. 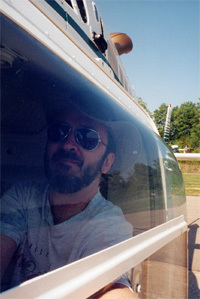 This winter (2001) this plane will be moved to another workshop where the engine and the instruments will be installed. First flight is approaching! 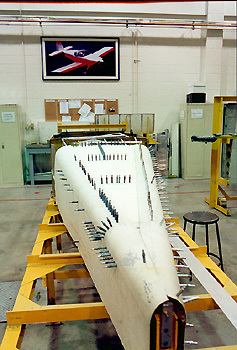 The second plane is under assembly (left picture) work is going along much more rapidly since the tooling is available. It is planned that the construction will last three years. This means that a student will be able to witness the entire construction process before he graduates. Here are two pictures from the composite lab. 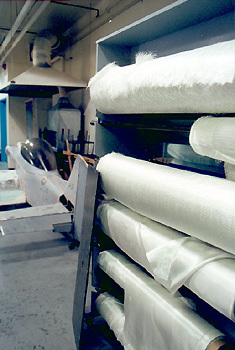 Right is a partial view of the lab with its fiberglass rolls and a composite aircraft. 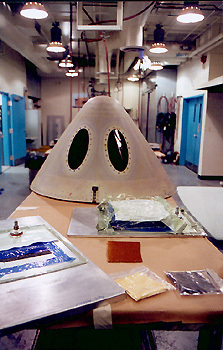 Below, a Bombardier Regional Jet nose cone. During our brief stay, we received information on how to make a light panel with resin and carbon fiber tissue. They also explained how they use air succion to remove air bubbles and excess resin, thus obtaining a light structure with no weak spots. Some pictures can be dowm loaded in enlarged format (~250 Ko). Simply click on the image if the cursor indicates a hot zone (finger pointing hand).